When I saw this kitchen from one of my favorite blogs - Jennifer Rizzo - I just studied and drooled over everything. Love the cabinets redo, wood counters and the wonderful chandy, curtain at the door, ok so I really love it all. Then I honed in on one thing that I could copy. See that fabulous silver tray above the stove. Well you all know that I totally love using my silver, and I have quite a few trays, so I am sure you get the picture. I have several trays that might work, so I immediately tried them all. I love the look of the large one above, but my space is quite small. I also really liked the handles on the tray above, but the only one I have with handles that fits this space has feet, so that wasn't working very well. After trying 3 different ones, I think this one is the best. I am using a silver tray in the corner display and this ties it in. What have you tried different lately and what has inspired you? Oooo Marty, I love using silver like that too! I love the color on your backsplash...and it really sets off the silver. Love the old cans you have on top too!! What a cute little tray, where it fits over the stove. I am trying to crochet little easter hats that I will try to sell * smile *. That looks so cute there. I think it would only need cleaning if you actually cook on your stove. If I put one above my stove it would stay clean forever. It's fun to get new ideas and inspirations, isn't it? Love the tray over the stove!! We are ALL copycats, Marty. Love the little tray! I love it! I know what you mean though, nothing stays the same very long here either, lol! What a pretty little tray! You will enjoy having it where you can see it! I love the tray it looks great. I love Jennifer's kitchen makeover, too, Marty! 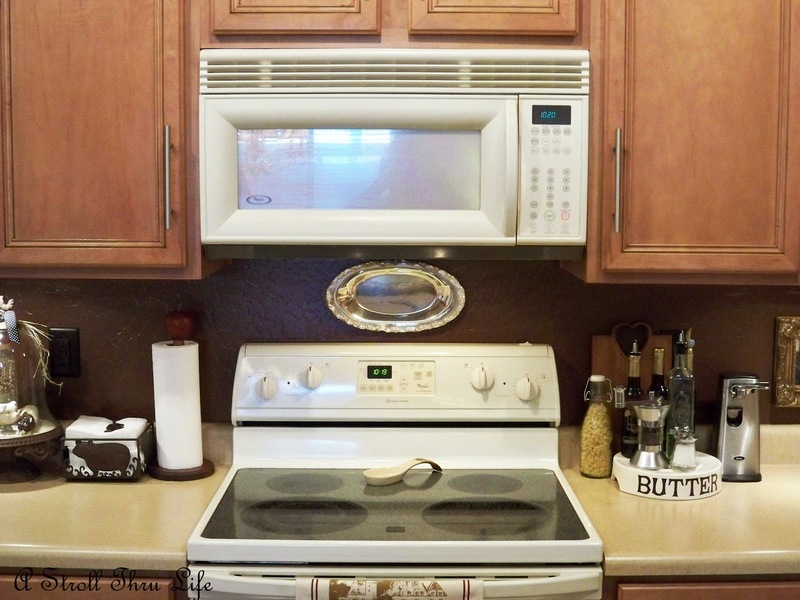 I had also noticed that tray over the stove, but, unfortunately, I have a microwave that is in the way. I like how you got the look with a little smaller tray, but I don't even have that much room! That looks awesome. You do have the most fabulous silver. Your inspiration is gorgeous as well. Perfect!! You needed this small copy-cat to make your lovely kitchen just right...for the time being! You sure have the right touch for things like that, Marty. I'm getting ready to do a whole kitchen makeover! I'm so excited and I'm visiting tons of blogs to get ideas! Unfortunately my stove area doesn't have much room over the stove to do something like this. What I have always wanted is the wrought iron sculpture like Charlie has on the tv show Two and Half Men. We'll see if I can make that happen for me! I wish I had the open top at the kitchen cabinets like you do. I would so fill them up, just as you did. I love that! I really like it Marty! I may have to be a copy cat too!! I enjoy your vignettes. You are very creative. I have a friend with a narrow space above the stove and she hung silver coasters spaced out in a line side by side by side for an alternative look. I saw that makeover too and fell in love as well! I like how you honed in on the silver trays on the wall. I myself was drooling over the chandelier, signs above the door and the painted cabinet. Beautiful stuff! I think the tray you chose works wonderfully and will only highlight your other silver pieces even more. Great detail! Fabulous idea. Looks perfect there. Curious to see how the "cleaning" will go. Her kitchen makeover is very inspiring. I love your silver tray over the stove. I love it! I love Jennifer's kitchen too. I like how you were able to incorporate that silver tray in your decor similar to hers. I would take it off the wall if you're cooking something that splatters though. Kitchen bling! I love it! Love your inspiration kitchen, too, especially that weathered green hutch off the to side. 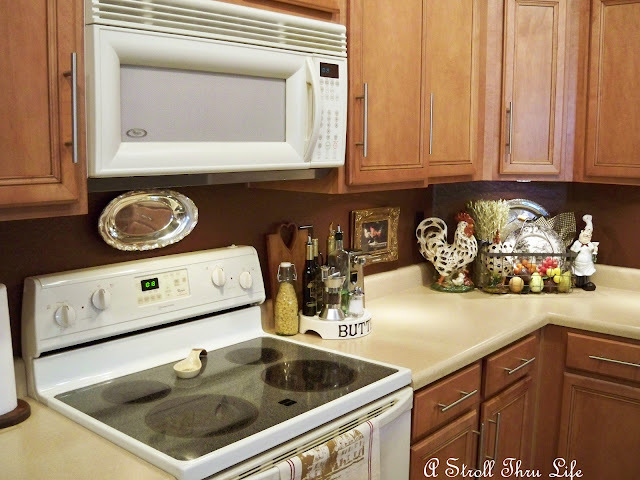 I love the silver tray over the stove. I have a microwave above my stove and even my littlest silver tray won't fit. Awesome job Marty! That is what this blogging gig is all about..inspiring and being inspired others. If we didn't get that out of it, what would be our point right? I love that kitchen too! A big island in the middle of the kitchen looks awesome. Don't ya just love getting ideas from other bloggers? I also love Pinterest where I get many, many ideas. Actually, Marty, you have inspired me! I love your cloche with the rooster on top! It is gorgeous! Marty you have such beautiful silver and you display it so very well!!! Looking at other blogs always sparks ideas for me or gives me something I could replicate. That does look good! I have two trays stacked together on my counter...I love to look at every detail people have and see if there is something that inspires me too! I like the tray you chose! Wow! Kitchen, my favorite place in our house, you can always see me in there you can't see me on the other places of the house. Love it, Marty! You have such beautiful silver!! 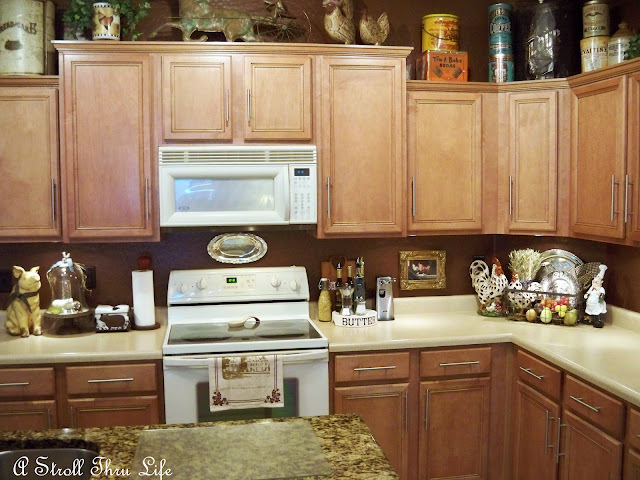 I just adore Jen's kitchen, and she was the one that inspired my kitchen paint re-do. Always love using silver, your tray looks wonderful, so elegant and classic! I just love when you & other bloggers take inspiration from others and inspire us! Thank you! The tray adds so much to your decor! Hi Marty, I love your tray above the range...so pretty!! I also loved seeing your bathroom reveal. It's such fun to visit, isn't it!! I agree, the silver tray above the stove is stunning! You are so correct...that kitchen is gorgeous!!! Thank you for sharing this lovely post with us! I found you quite by accident and am so happy that I did! You have given me so much inspiration. I can't wait to start re-decorating :) ... What a wonderful home you have.